A longtime favorite in our family of broccoli enthusiasts, this soup gets a thick, creamy base from pureed white beans or tofu. The addition of green peas at the end of cooking time brightens the color and heightens the flavor of the soup. This is great served with many kinds of wraps or sandwiches. Recipe from Plant Power: Transform Your Kitchen, Plate, and Life with More Than 150 Fresh and Flavorful Vegan Recipes by Nava Atlas. ©2014, published by HarperOne, reprinted by permission. Photos by Hannah Kaminsky. A longtime favorite in our family of broccoli enthusiasts, this soup gets a thick, creamy base from pureed white beans or tofu. Add the broth and broccoli. Bring to a simmer, then cover and simmer gently until the broccoli is tender but not overcooked, about 8 to 10 minutes. Add the beans or tofu and half the green peas. Continue to cook just until everything is nicely heated through. 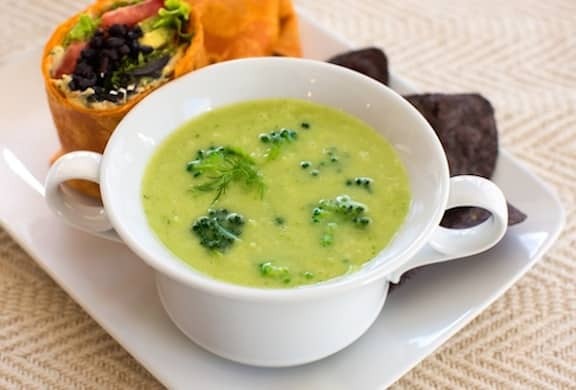 To finish the soup, add the remaining green peas, the finely chopped broccoli florets, the chopped herbs, and the lemon juice. Stir together, then season with salt and pepper. Cook over very low heat for 5 minutes longer, or until the finely chopped broccoli florets are tender-crisp, then serve. Could you make this ahead and freeze it?? Crystall, I’ve never had occasion to freeze this, as it always gets eaten so fast, but it has the kind of ingredients that would freeze well. Hope it works for you! I made this tonight and it was very easy, came together very quickly & is the BEST broccoli soup I have ever had! I made it with tofu. Thanks, Holly! So glad you enjoyed it. I hope you enjoyed it, Monika! I made this for dinner last night with the white beans option. The best I have ever had! Thanks, Lori; so glad you enjoyed it! Is the recipe for the wrap posted? If so, what’s it called? It look so good!! Thanks. Hi Jen, this wrap happens to be posted: http://www.vegkitchen.com/recipes/everyday-meals/sandwiches-and-wraps/hummus-wraps-with-grains-and-greens/ Thanks for asking! hi! 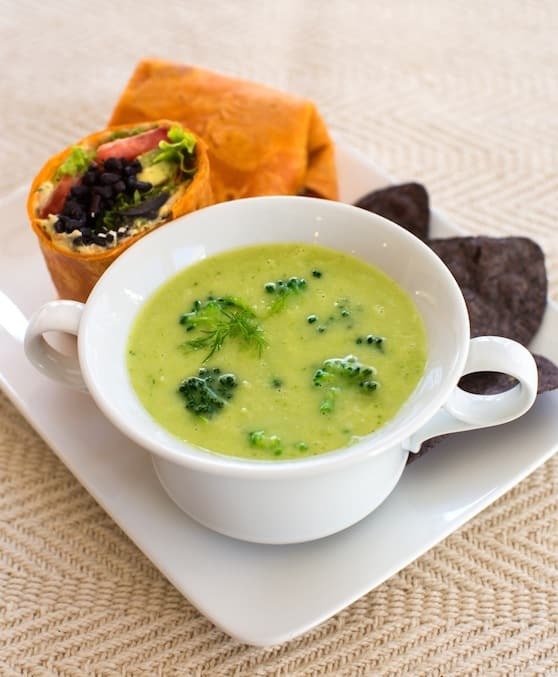 I’ve been looking for a vegan cream of broccoli soup!! how would you make it in the vitamix???/thanks!!! Lena, you can just follow the direction in paragraph 3, where it says “If you don’t have an immersion blender, transfer the mixture to a regular blender and puree (don’t overprocess! ), then transfer back to the soup pot.” You can do this in your Vitamix, and just make sure not to overdo it. It should work well, though! Hi Cay — sure, use frozen broccoli if that’s what you have on hand. Enjoy! Glad you enjoyed this, Julie, and I love your tweaks!